A maximum of know-how and expert knowledge is required for the manufacturing of textiles used in the public service. We are a reliable partner in the matter of public tenders in the fields of police, military and security forces for many years. We develop with our customers suitable fabrics for different applications. 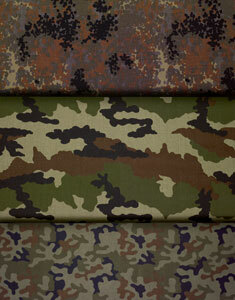 Fabrics with IRR finish and camouflage prints fulfilling European standards. Our detailed contact information and the imprint can be find with the following link. Our terms of delivery can be downloaded with the following link. C.F. WEBER manufactures high-quality technical textiles by using modern production technology.